To see what’s new, log-in to your existing Chick-fil-A One™ account online or via the Chick-fil-A® App. You can also become a member by creating an account online or by downloading the Chick-fil-A® App through the App Store or the Google Play store. Participation is subject to the Chick-fil-A One™ Membership terms. 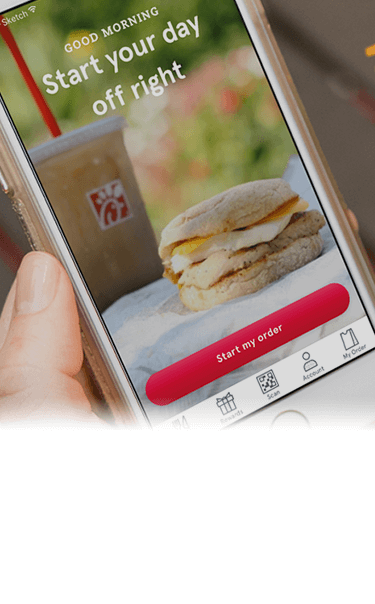 Members can receive points by placing an order through the Chick-fil-A App, an online catering order, or by scanning their Chick-fil-A One QR code at the register or in the drive-thru. Earn points for every purchase and use them to redeem available rewards of your choice. Each purchase gets you closer to the next membership tier with increasing benefits. There is no cost to join and anyone who is eligible to create a Chick-fil-A One™ account may participate. Members earn points with every purchase, earning more points per dollar spent as they reach new membership tiers. Points are awarded based on the total, prior to tax and current tier status. Points can be used to redeem available rewards or members can choose to save their points for redemption later. A list of available rewards and points needed for redemption are available in-app or through a member’s online profile. For the first time, members can earn points for online catering orders using their Chick-fil-A One™ account. Members may receive surprise rewards from their local Chick-fil-A restaurant(s). Each of the three membership tiers has increasing benefits, including receiving more points per dollar spent. Current membership status may be viewed through the app, by selecting "Rewards", or online. *All current A-List Members will be Chick-fil-A One™ Red Members for the first year. Members will receive points for online catering orders placed when using their Chick-fil-A One™ account. 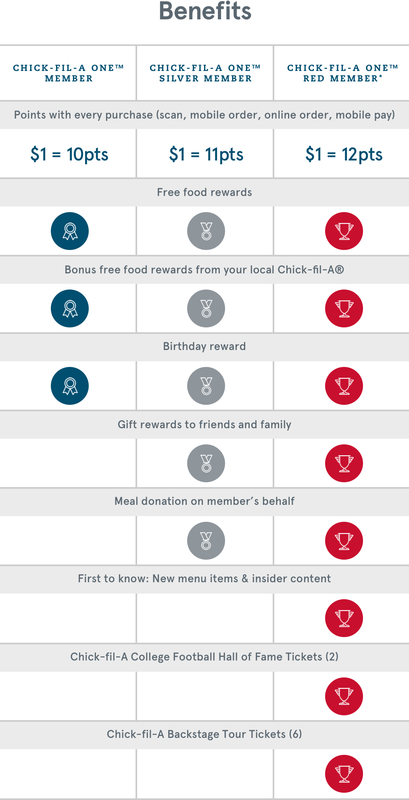 The ability to gift rewards to friends when you reach Chick-fil-A One™ Silver and Chick-fil-A One™ Red Member status. Every member receives a birthday reward. Learn more about our exciting new program here. Review our most frequently asked questions or click here for additional information. Do I need to create a new Chick-fil-A One account? No, you don’t need to create a new account. Simply update your Chick-fil-A App or sign-in online using the email address and password used during your initial registration for Chick-fil-A One. How do I become a Chick-fil-A One Silver or Chick-fil-A One Red Member? 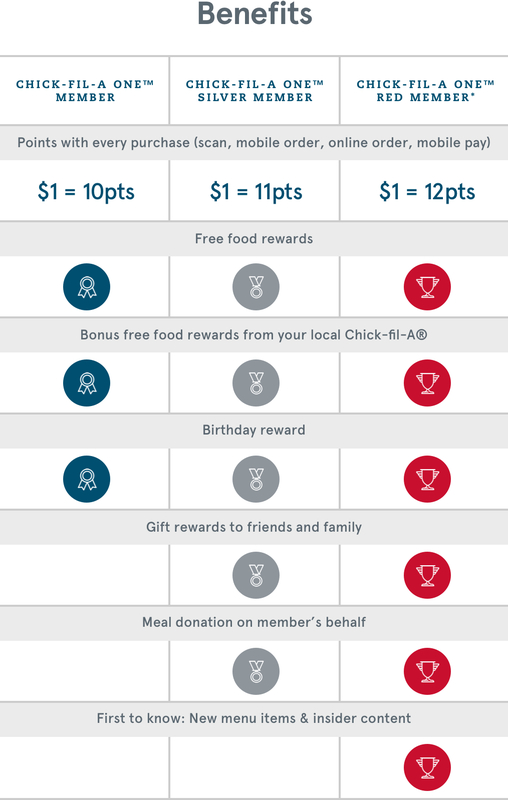 Your status is based on the points you receive for each purchase, the more you visit Chick-fil-A, the faster you will receive Chick-fil-A One Silver and Chick-fil-A One Red status. It will take 1,000 points to reach Chick-fil-A One Silver and 5,000 points to reach Chick-fil-A One Red. If I earn status as a Chick-fil-A One Silver or Chick-fil-A One Red member, can I lose it? Once a status is reached, you will have that status for one year. To view your status expiration information view the "Rewards" portion of your app or online. What’s different with this new app? As a Chick-fil-A One Member you receive points with every purchase that can be used to redeem an available reward of your choice. You can still do all the things you love like scan, mobile order, online order and pay. As an A-List Member, you are now a Chick-fil-A One Red Member for the first year. You now receive 20% more points with every purchase, along with additional benefits. How long should I wait before I receive points for my visit/ purchase? You should see your points within an hour of your visit. Can I still use my A-List Card? Yes, you can still earn points with every purchase by swiping your A-List card or scanning your Chick-fil-A One QR code available to view and print online. Want to know more about a Chick-fil-A One™ account? Rewards can include food items you wish to redeem using your available points, surprise rewards sent by a local Chick-fil-A® restaurant or giveaways. How will I know when I receive a reward? When you receive a surprise reward from a local Chick-fil-A® restaurant, you will receive an email notification as well as a notification in-app. You can view all available rewards through the “My Rewards” portion of your app or online. What happened to my previous progress? As of August 1, 2018, any current progress earned with the old app and treat tracker, was converted to points. Points were calculated using the total dollars spent since earning your last treat and then multiplied by 10 if you are a Chick-fil-A One Member or by 12 if you were an A-List Member. Total points earned will also include new points earned through your purchases with Chick-fil-A One since August 1, 2018. For any new purchases after August 1, 2018, you will earn 10 points per dollar spent as a Chick-fil-A One Member, 11 points per dollar spent as a Chick-fil-A One Silver Member and 12 points per dollar spent as a Chick-fil-A One Red Member. Available points can be found through the app by selecting "Rewards" and then "Points” or online. Rewards may have different expiration dates. You can view available rewards and expiration dates through the "Rewards" portion of the app or online. Why are some rewards greyed out? Rewards that are greyed out are those currently unavailable to redeem based on your points. You can view your total available points through the “Rewards” portion of the app or online. You can redeem your points for an available reward of your choice through the Chick-fil-A App by selecting “Rewards” and then “Redeem” or online. You can choose to redeem your points for an available reward at any time by visiting the reward portion of your app or online. Will I lose my existing treats? No, any current treats will automatically become rewards. The expiration dates on individual rewards will not change, so be sure to redeem each by placing a mobile order or scanning your QR code before they expire. I went to the rewards portion of my app, but don't see my old treats? Please ensure you are signed in using the correct email address and password associated with your Chick-fil-A One account. Treats may have also expired or been used during a recent transaction. Want to know more about Chick-fil-A One™ rewards? Does the purchase of a Chick-fil-A ® gift card count towards my points? Chick-fil-A Gift Cards count towards your Chick-fil-A One points when they are used, but not when they are bought. What if I forget to scan during a visit to the Restaurant? You may request credit for a missing transaction by visiting here. You will be required to log into your Chick-fil-A One™ account and fill out all of fields in order to request missing credit. Please note that approved requests only apply to a limited amount of transactions per Chick-fil-A One™ account and must be submitted within 30 days of the transaction. Points will be awarded based on your total, prior to tax and your current tier status. Can I use my app at licensee locations? The Chick-fil-A app is not presently accepted at Chick-fil-A Express and Chick-fil-A licensed locations such as those in airports, college campuses, office complexes and hospitals. These locations are not owned and operated by Chick-fil-A Franchisees but are operated by professional third-party food contractors. Their operating systems do not currently offer guests the ability to earn points or redeem rewards through the Chick-fil-A app. As a Chick-fil-A One Member you receive points with every purchase that you can redeem for an available reward of your choice. You can still do all the things you love like scan, mobile order, online order and pay.